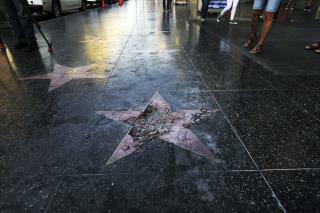 (Newser) – It's unanimous, at least in the West Hollywood City Council: The group voted Monday night to get rid of President Trump's star on the Hollywood Walk of Fame, reports the Wrap. The resolution urges the Hollywood Chamber of Commerce and the City of Los Angeles to remove the star, the target of repeated vandalism, due to Trump's "disturbing treatment of women and other actions." The group didn't pass the nonbinding resolution "because Donald Trump is a conservative or a Republican," West Hollywood Mayor John Duran tells NBC News. "Earning a star on the Hollywood Walk of Fame is an honor. When one belittles and attacks minorities, immigrants, Muslims, people with disabilities, or women—the honor no longer exists." He adds to the Washington Post: "To think that we would pay tribute to someone who's causing such a horrible disaster to our country's values." They should rename it: "The Walk of Shame". you realize nobody in hollywood cares about any of those stupid stars. the only ones that look at them are tourist from middle america. "Trump's "disturbing treatment of women"...what a bunch of idiots. Almost every male Hollywood elitist who has a star has at one time or another raped and abused women.